One of the staples of Valentine’s Day is absent from store shelves this year. The heart-shaped candy known as Sweethearts, or conversation hearts, will not be part of the seasonal aisles this February. You may have already noticed this if you’re part of the over 55% of Americans who buy $1.8 billion dollars worth of candy for Valentines Day. So, why are these chalky messengers of love missing? Back in July, 2018, the New England Confectionery Company, or NECCO, who were the producers of Sweethearts went out of business. The little candy hearts that were the most popular candy of Valentine’s Day 2018 will not be able to put the candy on the store shelves for this year. This is the first time in 153 years that the conversation hearts will not be sold. These tiny candies have been around longer than Southern Utah University, the Walt Disney Company and broadcast radio. However, in September 2018 NECCO was purchased by Round Hill Investments and the Sweethearts brand producer of the conversation hearts since 1860s was then sold to the Spangler Candy Company. While this Valentines Day 2019 may be devoid of the iconic chalky love hearts, they will be ready to hit the shelves next year. As it turns out, making enough conversation hearts to meet the holiday demands takes more time that you might initially think. 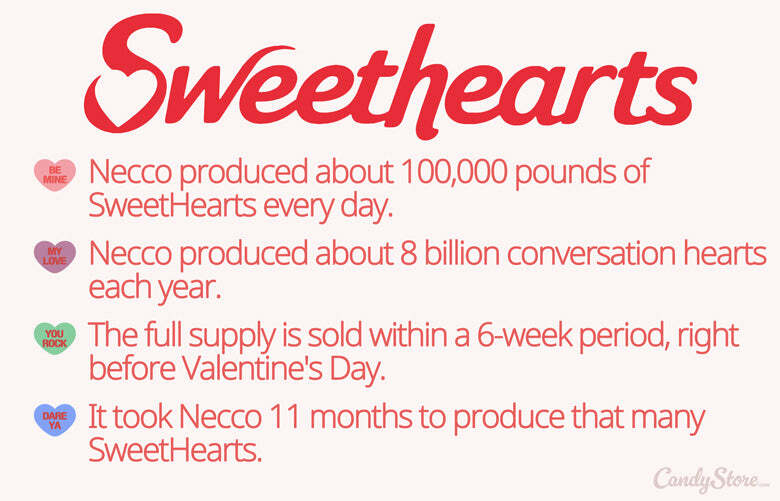 NECCO used to produce approximately 100,000 pounds of Sweethearts conversation hearts every day for 11 months in order to meet the Valentines Day market’s need. This time next year, you will once again be able to ask someone to “be mine” and declare them to be your “true love” all through the language of multicolored heart candies. Photo by: Gingerhill Cookie Co.